The graceful baroque church of St Mary le Strand might have been less lovely to look at if Queen Anne had not died in 1714. For at the time of building, St. Mary's was not supposed to have a steeple. Instead, the church was to have a 250 ft high column put up beside it with a statue of the queen on top. When she died and the project was scrapped, St. Mary's got its steeple after all. Erected between 1714 and 1717, St. Mary le Strand was the work of the architect James Gibbs, whose reputation was made when its beauty and delicacy was widely acclaimed. The church was built to replace a much earlier version which stood a short distance away on the site of Somerset House. Thomas � Becket is said to have been a rector there. The second St Mary's has several claims to fame of its own, though. A large Maypole once stood on the green outside and although the original was destroyed by the Puritans in 1644, a new one was put up during the Restoration, much to the delight of the common folk. This in its turn was taken down in 1718 when it was bought by Sir Isaac Newton to support a telescope. More than thirty years later, in 1750, St. Mary's is said to have had a clandestine visitor in the shape of Prince Charles Edward, better known as 'Bonnie Prince Charlie'. The Prince allegedly renounced the Catholic faith and was received into the Church of England here during a secret five-day sojourn. St. Mary le Strand also has a connection with Charles Dickens. According to the church registers, his parents John Dickens and Elizabeth Barrow were married here on June 13, 1809. An unusual and interesting church, St. Mary's has unfortunately been cut off from the surrounding streets by London's changing traffic system. This has left it looking rather forlorn on a little island in the middle of the road. But its interior is well worth dodging the taxis and buses to see, in particular it has an elaborate plasterwork ceiling which is best viewed through the mirrors left out at the back of the church. 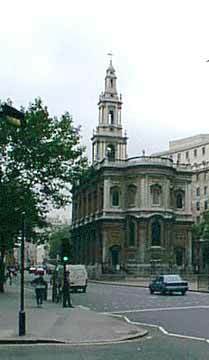 * St. Mary-le-Strand is the official church of the Women's Royal Naval Service, the Women's Royal Naval Reserve and the Association of Wrens. A Book of Remembrance records the names of members who have died in service from the First World War to the present day.